We wanted to show you how simple is to add wireless control feature to your embedded device using WiFi PLUS click boards. Fancy touchscreen interface implemented on mikromedia for PIC18FJ allows you to view ADC acquisition, digital input and to control digital output on EasyPIC v7 board. 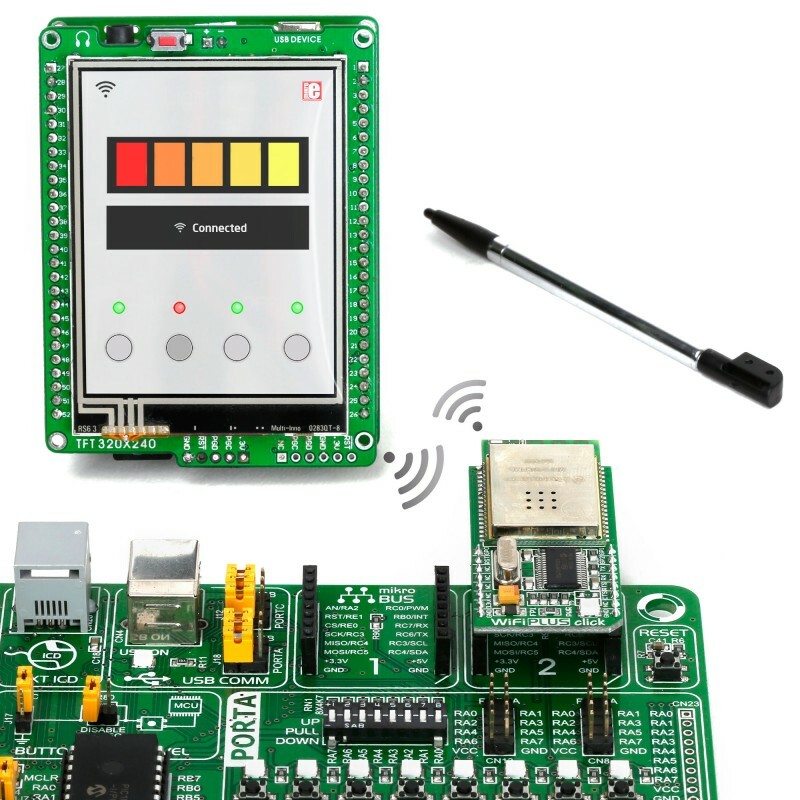 WiFi PLUS click board features MCW1001 companion controller with TCP/IP stack. Wireless control is now in every home. Wireless internet communication is a must have in modern devices. Beautiful graphical interface developed using Visual TFT software is intuitive and easy to use. With a touch of a screen you can change state of your digital pins of PORTA and you can also easily monitor predefined analog and digital lines on EasyPIC v7. Code is developed in mikroC, mikroBasic and mikroPascal compilers for PIC. Smart programmable touch 2.8'' display, packed with features. Mikromedia can be used for controlling a wide range of applications: from simple hobby projects, up to entire machine installations. It is powered by PIC18F87J50 microcontroller unit, it gives you true power to build GUI-centric embedded applications. Need a mass storage in your device? With our class 4 microSD card you have 2GB of memory and additional adapter for full compatibility with your devices. It is suitable for usage with microSD and MMC/SD slots on mikroElektronika development boards and add-on boards.